You are currently browsing the category archive for the ‘ugly sweater contest’ category. For the second time in the span of a month, I have officially lost an ugly sweater contest. Thanks again to all of you who voted. For those that didn’t, don’t worry. I doubt your vote would have helped. The winner collected a whopping 273 votes to my 124. Now that the contest is over and the winner’s full name has been revealed, I’m hoping she will agree to speak with me for a Q&A. With any luck, she’s reading this now. And is probably starting to think I’m crazy. She’s probably right. Nevertheless, I’m honored to own the second ugliest sweater in the Triangle. Down. But hopefully not out. 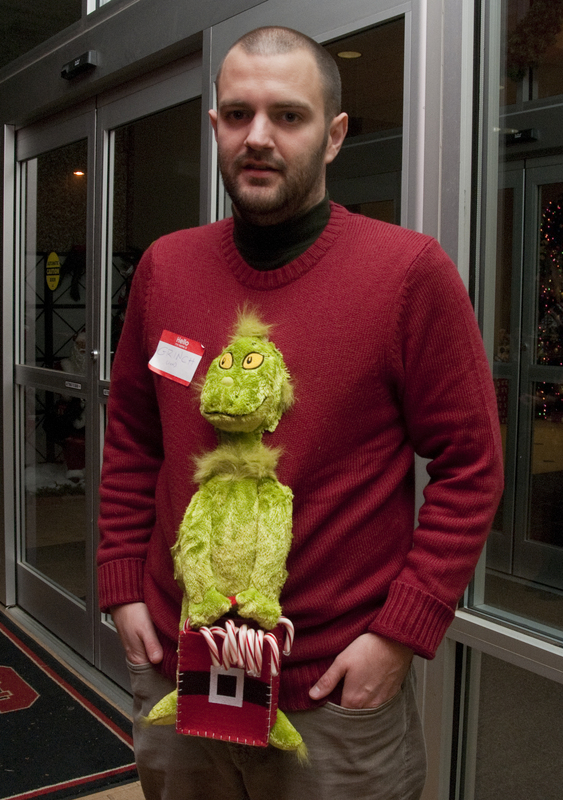 Thanks to all of you who have voted for my Grinch sweater in the News & Observer’s Ugly Sweater Contest. Unfortunately, I’m currently in a distant second place and the Food Bank of Central and Eastern North Carolina’s chances of winning the prize (a $50 Visa gift card) are dwindling. I’m trailing Jessica and her Beer Carrying Christmas Sweater 162-91. Oh, wait. It just went up to 169-91. While her sweater is perfectly fine, I smell something rotten. Despite the fact that I’ve told nearly everyone I know about the contest via this blog, Facebook, Twitter, and both my personal and work e-mail accounts, I’m still getting smoked. Even when my votes go up by 5, hers immediately soar by 10. I find it hard to believe that someone has convinced that many people – in such a short time span – to register for the site, thereby giving the N&O their address, phone number, e-mail, and firstborn. It’s almost like she’s voting for herself, which I’m told is possible if you log out of the site and restart your browser. It’s so frustrating that I briefly flirted with a co-worker’s offer to help rig the contest. With an hour of his time tonight, he said, he could guarantee me a victory. And he wasn’t joking. I knew this wasn’t a good idea, but I couldn’t help telling a few friends and Carie. All of them agreed that it wasn’t worth it. Especially Carie. But in the end, I’d rather be an honorable dunce than a cheating king, so I refuse to rig the contest. Plus, Jessica might just be winning this contest fair and square. Either way, maybe you should go vote for me. A few hundred times.